← Has your brain ever taken a Twitter day? It may not be armed robbery, but the illegal business of fraudulent car accidents is a multi-million dollar racket, involving unscrupulous medical providers, personal injury attorneys, and the cooperating passengers involved in the accidents and who also receive a portion of the illegal proceeds. What makes good people turn to crime—any type of crime? Newly engaged, Nathan and Shari are blissfully happy—but their joy is tempered by the dark cloud of mounting debt. They know it’s just a matter of time until an avalanche of bills buries them—and their future along with it. A chance encounter with a stranger in whom Shari confides her troubles, proves fortuitous: he tells her of a get-rich-quick scheme that will put her and her fiancé on easy street. Seduced by the chance to move from hard times to good times in no time, she takes the carrot offered her, and finds herself acting as a “stuffed passenger”—the “victim” in a staged auto accident. The act goes according to plan and Shari gets her payday. She goes back for more—again and again, eventually becoming trapped in a dark and dangerous underworld, dragging her fiancé with her. Getting out and breaking free will take nothing short of a miracle. 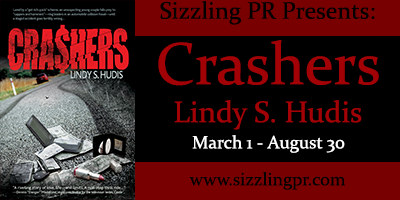 A modern day cautionary tale, Crashers is a fascinating study in the derailing of a young couple’s moral compass. 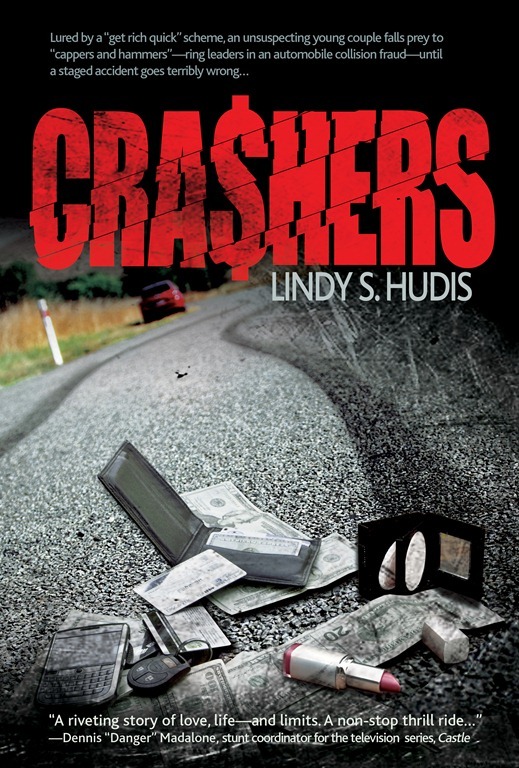 Lindy S.Hudis is a graduate of New York University’s Tisch School of the Arts, where she studied drama. She is a former actress, having appeared on such television shows as “Sunset Beach” and “Married with Children”. Her romantic murder mystery, Weekends, is currently available from Lachesis Publishing. She is also a filmmaker, her independent short film “The Lesson”, which she wrote, produced and directed, screened at the Seattle Underground Film Festival. She is co-owner of an independent production company called Impact Motion Pictures. She and her husband Steve, a Hollywood stuntman, have just completed the screenplay adaptation of Charmaine Hammond’s best selling book, “On Toby’s Terms.” She lives in California with her family.